# For what positive value of x  x^2 = 2 ? 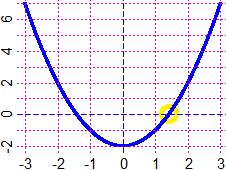 # Between 0 and 2 the graph of  f  cross the x axis. # F changes the sign. # The procedure "solution" automates this process. # NOTE. Why (to calculate the mean of a and b) we use a+(b-a)/2 instead of (a+b)/2 ? # compute (5.0000003 + 5.0000004) / 2 I obtain 10.00001/2 and the 5.0000005. # I get results that are out of [a,b]. # If I use a+(b-a)/2 I cannot get values outside [a,b].